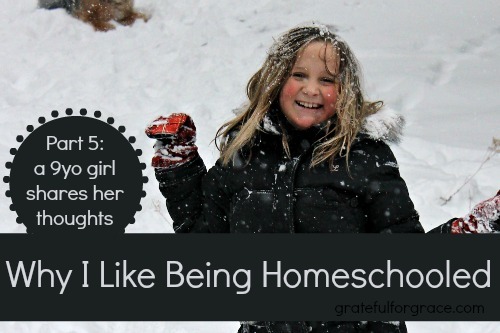 Why do you like being homeschooled? I like being homeschooled because I get to spend more time with my family. I can play with them all day. I love that. I also like that I can do double school work in a day and have the next day off, if I want to do the work. I can look at my assignments in the lesson plan book and do my work for that day and the next. I like to do that so I can have a slumber party with Phoebe. Or have a friend come over to play. I don’t like having to learn Latin. It’s hard. Sometimes being with your brother can be annoying. Just sometimes though. Will you homeschool your kids? Why or why not? I will homeschool my children so that they can spend more time with the family. And to save money from buying a lot food for their lunches every day. And because I don’t want them to be public schooled. It’s fun! Lots of fun. And I don’t like being homeschooled, I LOVE IT! Do you have any questions for Esther?